This project explores how residents might use data generated by sensors in the city. Following a user-centered design process, I ideate concepts, interview people who run in the city, diagram the research to discover insights, and create and test a prototype. DESIGN . RESEARCH . PROTOTYPE . This project translates a historic method of visualizing history into a web-based tool through brainstorming, designing, and implementing new interactions. Using knowledge from the both the fields of information visualization and human-computer interaction, I brainstormed, designed, and prototyped the tool along with another graduate student and then two undergraduate students. As a team of four, we explored data from Citi Bike, a bike sharing service in NYC. 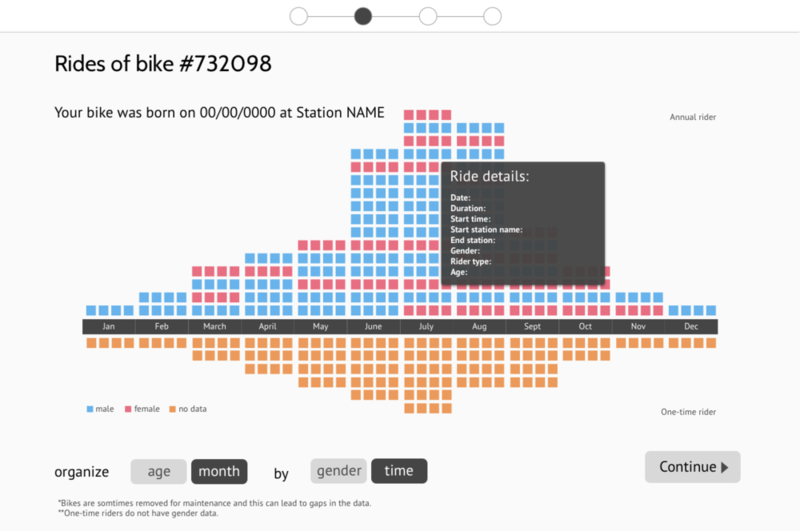 Rather than featuring data that might be helpful from the perspective of a Citi Bike planner or a city planner, which has been done before, we explored it from the perspective of the bike itself - to tell a story that had not yet been told. Through designing wireframes, I helped shape the story and the way in which it is experienced. Details coming soon. My internships at BMW, AT&T, and Intel are all under strict NDA. If you are curious, I can speak generally about them in a private conversation. I am a UX researcher and designer based in Portland, Oregon.